Super crystal clear tips, natural "C" curve, half-moon nail bed. Thin, flexible, and durable. Made in USA. Forever French white tips, natural "C" curve, half-moon nail bed. Thin, flexible, and durable. Made in USA. Natural color tips, normal "C" curve, half-moon nail bed. Thin, flexible, and durable. Made in USA. Magnificent Pearl French tips, natural "C" curve, half-moon nail bed. Thin, flexible, and durable. Made in USA. Green French color tips, natural "C" curve, half-moon nail bed. Thin, flexible, and durable. Made in USA. Red French color tips, natural "C" curve, half-moon nail bed. Thin, flexible, and durable. Made in USA. Violet French color tips, natural "C" curve, half-moon nail bed. Thin, flexible, and durable. Made in USA. Perfect smile line, streamline arch, no blending, 100% pure ABS plastic. Transparent, natural arch, expanded contact point, 100% pure ABS plastic. Enhanced arch, expanded contact point, flexible, 100% pure ABS plastic. Natural arch, expanded contact point, square sidewalls, 100% pure ABS plastic. Featuring a uniform, high profile curve design, conforms nicely to all nail shapes, great base for nail art. Size 1 to 10. Symmetrically arched for lateral side-to-side custom fit. Perfectly curved at any length. Size 1 to 10. 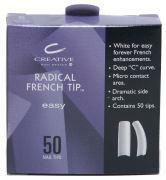 Featuring a perfect french smile line and natural shape. Minimal overlap area eliminates blending. No well at contact point. Size 1 to 10. Gentle "C" curve. Full contact area. Natural side arch. Size 1 to 10. Gentle "C" curve. Full contact area. Natural side arch. 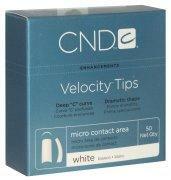 Contains 50 tips per box. Beautiful white color. Deep "C" curve. Micro contact area. Dramatic side arch. Contains 50 tips per box. Natural color. Deep "C" curve. Micro contact area. Dramatic side arch. Contains 50 tips per box. White color. Deep "C" curve. Micro contact area. Dramatic shape. 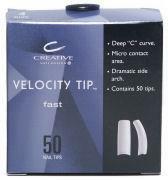 Contains 50 tips per box.